How can you organize your garage, workshop or hobby room tools without feeling overwhelmed? I had several false starts trying to organize my workshop but there were too many tools and too many different ways to organize them so I just could never get started. I finally got tired enough of walking around piles and hunting for tools and supplies that I committed, sink or swim, to defeat the beast. I worked on it one group of tools at a time and now I enjoy my shop more than ever. ​An unexpected advantage to having every tool in a marked location is that I no longer dread or put off putting everything away at the end of each day. Now I just grab a hand full of tools and materials and drop them in slots as I take one lap around the shop. Now it is actually fun to fill in all of the empty spaces of the tool holders when I finish working each day and it takes less than 5 minutes. I end each day with a sense of completion and hit the ground running the next day with a focused mind and no messes to sort through. 1. Clear off a horizontal area on a table or workbench. Make sure this area is separated from adjacent areas so you won't use the space for anything else over several weeks. If it helps you can mark it off with masking tape to maintain the area exclusively for this purpose. Ideally you will block this area off for at least 10 work sessions so pick an area that you can spare for that long. 2. Store EVERY portable tool that you use over a period of 10 work sessions (and nothing else) in that area. Don't worry about organizing them yet. See the photo below for an illustration. Your pile will look much different than this but you get the idea. 3. After 10 or more work sessions, put ALL of the tools that you did NOT use in a storage area separated from your main work area. Don't worry about missing tools you might want to organize, you will go through this exercise more than once so you will get a chance to add more tools that you use later if you need to. You will probably find that the tools that you actually touch and use in 10 work sessions is a small fraction of the tools you own. Sorting only the tools that you use often is a MUCH easier task that will keep you from giving up before you even get started. 4. Think about how you use your tools then sort them into groups. For instance, I sorted mine into "cutting and scraping", "marking and measuring", "pliers, adjustable wrenches and allen wrenches", "drilling and boring", "metal working tools", etc... The group names and how many tools go into each group will be completely custom to the way you use your tools and which tools you have. You will get a chance to try out your "groups" so don't worry about getting them perfect right away. Pursuing perfection will cause paralysis so just move forward and later you can always adjust anything that you don't like. 5. Cut multiple pieces of cardboard 11" x 17" (or whatever size you want your tool holder panels to be). Each panel (or multiple panels) will represent a designated tool group. Sort the pile you created over several weeks onto the cardboard panels by group. I'll show an example below of some cardboard tool panels I started out with. Don't worry about getting everything right at this point. This is a time to use the tools and groups that you've chosen using these temporary cardboard panels to see if you like them before you invest time into making permanent tool holders. Use your tools naturally and put them back onto their designated panels when you are finished working each day. You might notice how much easier it is to put tools away just by using the cardboard panels groups. I used mine this way for months before I decided to put them on tool holders off of the workbench. Over a period of four or five work sessions you will start to get a feel for how you may want to rearrange tools into different groups. You will probably see that you add some tools over time and end up not using some of the tools you started with at all. 6. Once you are sure you have a group of tools grouped the way you want, organize the tools ONE GROUP AT A TIME in the order you want them on each cardboard tool panel. Now its time to make your permanent tool holder panels. I suggest finishing one tool panel before you move on to making another one so you don't feel overwhelmed or distracted. I started with the "marking, cutting and scraping" group shown in the photo below. 7. Next, build a tool panel using wood, metal, pegboard, foam, hooks, shelves, magnets, slots, premade holders, foam with cutouts or whatever method you prefer to organize that set of tools on the panel. At this point you should be comfortable with the groups and tools that you have chosen for each panel so you don't have to repeat this step very often. For the tool panel shown below I used a piece of 1/4" Baltic Birch plywood with neodymium magnets recessed and glued with CA glue and small wood blocks to keep the heavy items from sliding off the magnets. I used screws to hang the shears. I used foam tool holders for a while but I just didn't like the extra couple of seconds it took every time I had to pinch a tool to get it out or push it in so it didn't fall out. The plywood panel with magnets and hooks It is very basic but it works great. 8. Mark the outline of each tool on the holder so that it is clear which tool goes in each position. It can also be helpful to hand mark or add a label that describes the tool. This makes it super easy to figure out if a tool is missing. For this tool panel I just marked around the tools with a Sharpie marker then I printed labels on paper and attached them with contact cement and covered them with clear polyurethane. Using a sharpie to mark the names of each tool would take much less time. In the photo below I used printed photos to mark tool locations. I like the end product but this was time consuming and so I only used it for one tool panel. I simply took a picture of the tools on the tool panel then printed the picture and cut the outline of each tool out with scissors. I then glued each picture onto the panel and coated it with clear polyurethane. For this panel, the tools are held onto the panel with neodymium magnets, L brackets made from laser cut acrylic and 3D printed brackets with magnets to hold the drill bit sets on the bottom right. The individual tool holder labels were laser engraved. All of these things can be accomplished with traditional woodworking tools but digital fabrication makes it much easier to get creative with your solutions and later on you have all of the design files available so its a breeze to modified and remake designs with very minimal time and effort. Part of the mission of Shop Hacks is to help you become familiar with and see the value of digital fabrication tools such as CNC's, lasers and 3D printers to save time and unleash your creativity. These tools are becoming easier to use and more affordable than ever so most are within reach of a large market. Also, most medium to large size cities offer maker spaces where you can use these tools for free or for a very nominal cost! 9. Hang your tool panels near areas they will be used. You might be surprised how much time can buy back each day by by storing tools in sight within arms reach. Save over processing by being able to quickly move tool panels anywhere in the shop using French cleats to secure them to the wall or to stands. Using a French cleat wall system will allow you to easily organize and reorganize your work area with very little effort. As you can see in the photos below, I hang groups of power tools on panels with french cleat hangers. These cleats can be cut with a CNC, a jig saw or a bandsaw. 10. Repeat this process as needed until you've worked through several types of projects. Now you have a much more manageable number of tools to organize. The type and amount of tools that end up in this space will be completely different for everyone. You may need to repeat this exercise several times as you work through different kinds of projects that require different sets of tools but just get started eating the elephant and don't think about finishing everything at once. I almost gave up several times because I started out trying to figure out too much at once. Just break it down into a manageable amount and get started. You will become more motivated after you start enjoying the benefits of each completed tool panel. Over time you will finish and enjoy the benefits from then on. Why does organization matter? What are the principles involved? Let's take a brief moment to talk about the underlying principles that should guide any organizing project. Following a principled approach is like using a map to travel from New York to San Francisco. Going by what feels good at the time is like trying to make that trip using only a compass. With enough time you will get there either way, but following principles will get you where you want to go faster and with much less work. They save time because you know where to point the arrow before you even start a project. You can read more about the seven wastes HERE. Move EVERYTHING out of your active work area that you have NOT touched at least once in the last 3 months. Trust me, this is the only way to prevent wasting valuable time and space. Group tools that are frequently used together or for a particular type of work. Start by building a tool board for ONLY ONE GROUP OF TOOLS. This will prevent feeling overwhelmed and lessons learned will translate to your next tool board build. 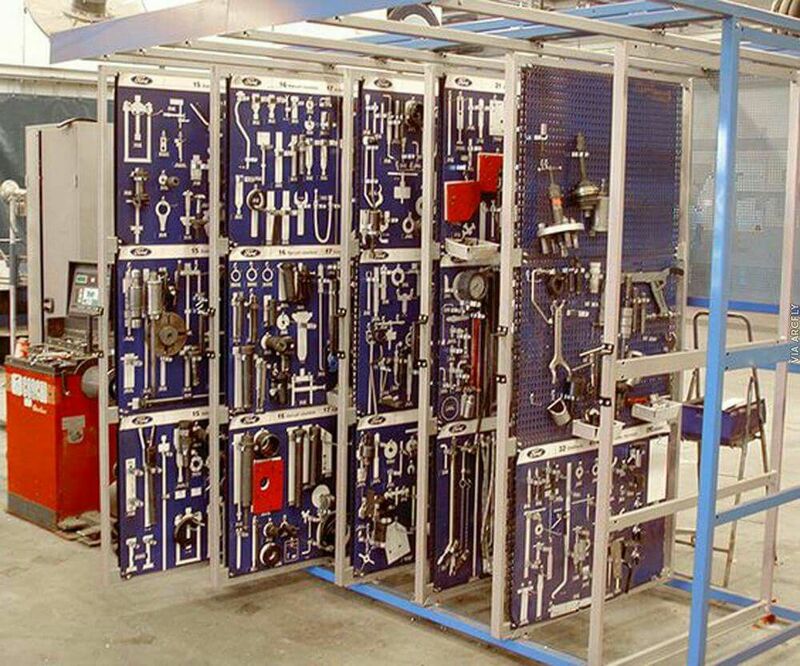 Place EVERY tool in a MARKED and VISIBLE location, preferably on some type of mobile tool board. Having to be able to see your tools and setting a goal to have every one in a marked location is a very objective measure that will help you get around the tendency to take short cuts that will undermine your efficiency. ​Drawers, cabinets and boxes are out of sight and are less efficient ways to store frequently used tools. They are great for storing the tools you don't touch at least once a quarter. ​* We respect your email privacy and will never send spam or sell your contact information.